When GPS Leads You Astray. . .
Is it just me, or are the amounts of GPS horror stories increasing? Who can forget the man who drove his truck into a cherry tree, or the woman whose GPS led her directly into a river?! Crazy but all true! Well here’s another one for you (it looks serious, but thankfully there weren’t any major injuries). 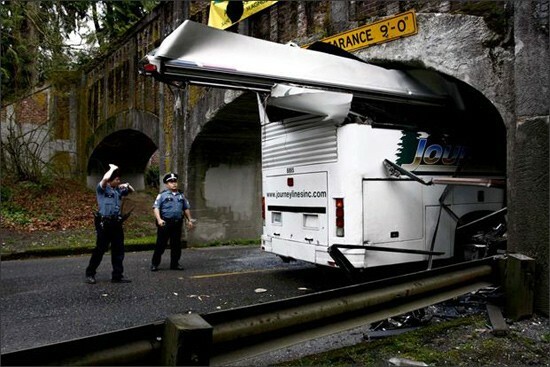 According to the Seattle PI, a driver of a bus carrying a girls softball team hit this 9-foot bridge when a GPS navigation system routed him the wrong way. And yes, the driver just so happened to miss the ginormous yellow clearance sign on the side of the bridge (the bus measured 11-foot, 8-inches high). GPS units have certainly got me lost a few times, but – knock on wood – I haven’t had any accidents because of them! Have you? How tall is too tall? I guess we’ll know once one of these crazy building concepts ends up getting built — if it subsequently falls down, that is. The Ultima Tower is a conceptualization by designer Eugene Tsui and it’s built around alleviating city congestion in this increasingly congested world. It’s debatably attractive shape is inspired by termite mounds and, instead of trying to brave the winds as your ordinary block-like skyscraper, it slopes gracefully to a point from a 7,000-foot-in-diameter base. The Ultima Tower is designed to provide good ol’ self contained arcology living, takes advantage of renewable wind energy, has its own water supply at its base and throughout the tower, and uses reflecting mirrors to boost the amount of natural light throughout. I wonder what construction firms think when they look at concepts like this? 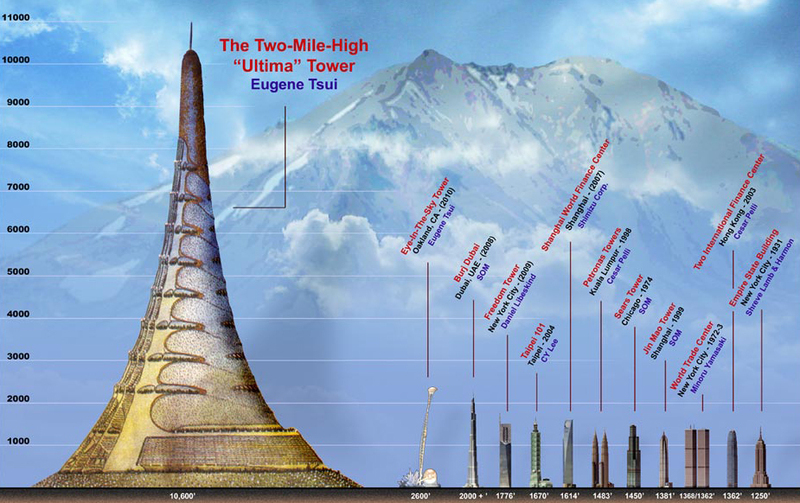 At least Tsui made it aerodynamic — it’d be a pain if it created some drag against the Earth’s orbit. At this point, having a 60-inch TV won’t win you any neighborhood mid-life-crisis contests, as everybody is getting giant TVs these days. Now, you need to take it to the next level if you really want to prove to everyone how desperate you are to distract yourself from the looming shadow of death’s cold grip. What could be better than installing a gigantic drive-in theatre screen on the side of your house? You can’t get a TV much bigger, and it shows that you’re in touch with your childhood in the era of drive-ins while staying rooted firmly in the present. Wait, you were alive when drive-ins were still popular? Man, you are old! No wonder you’re freaking out. you’re loaded and don’t mind dropping upwards of $50,000? Hey, good for you. Jeremy Kipnis’ $6 million home theatre setup.